Paul Ruppert, a D.C.-based restaurateur, will open the first independent bookstore in the District in 10 years. For D.C.-based restaurateur Paul Ruppert, a typical post-college Friday night included drinking cheap beer and hanging out at a bookstore. Two popular Petworth-based restaurants and bars later, Ruppert is ready to recreate the second part of his postgraduate experience in the neighborhood. Opening late next month, Upshur Street Books will be the first independent bookstore to open in D.C. in 10 years and Ruppert’s third project on the block in the past 13 months. The first, Petworth Citizen, is celebrating its one-year anniversary this month, and his latest restaurant, Crane & Turtle, opened three months ago. 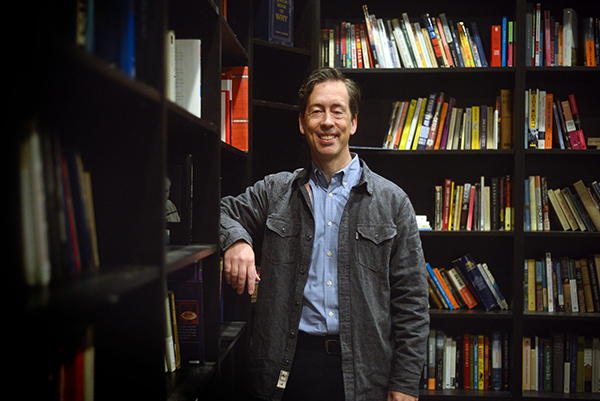 And while the first two projects have been restaurants, Ruppert is expanding on his artistic background – he is the founder of the Warehouse Theater, a black-box theater space on New York Avenue – to “join commerce with the arts.” He partially started that venture with the Reading Room in Petworth Citizen, which holds about 2,000 donated books. “We landed on bookstore because it builds off of the literary components of the Reading Room, and a bookstore is just a great compliment to bars and restaurants,” Ruppert said. He hopes his three Upshur Street businesses will work in tandem, drawing booklovers to the restaurants after a reading or giving people a place to stop after having a meal. In a region dominated by staples like Kramerbooks & Afterwords Cafe and Politics & Prose, the new store in Petworth hopes to become a center for local writers. Ruppert said the influx of millennials to the neighborhood make it more diverse than the Chevy Chase neighborhood, where both Ruppert himself and Politics & Prose reside. “One of the big things about Petworth is that it does have a lot of writers that live there, so we want to be a home base for our neighbors in Petworth and the surrounding neighborhoods,” Ruppert said. Petworth resident Anna Thorn will be the general manager of Upshur Street Books, bringing four years of experience from her time at Politics & Prose to the fledgling store. While Thorn said she was excited about the opening of another independent bookstore in D.C., especially one located in the heart of her own neighborhood, she initially turned down the job offer, nervous that this new store might not be a success. But after re-evaluating the decision, she decided to trust the drive that pushed her to apply for the job in the first place: She wanted to get back into book selling. “[Politics & Prose] is getting so big that it’s very specialized, and I wasn’t on the book floor very much anymore and I missed the contact with the books and the customers,” Thorn said. Thorn said Upshur Street Books will focus on innovation and drawing in the younger city crowd who she hopes will be receptive to her plans, which include rotating artist shows and displays for local pottery, jewelry and glassware in addition to traditional readings and a space for locals to highlight their own small, home-grown literary events. Ruppert said the store will have enough space for about 50 people during events, compared to the smaller Reading Room in Petworth Citizen, which only holds about 25 people. With tables on wheels and a periphery of larger wall shelves holding everything from children’s books to the works of D.C.-based authors, the store can transform into an open area for events and readings. And because it’s more Metro accessible, compared to Politics & Prose, which is further out in the Chevy Chase neighborhood, Thorn is optimistic about its prospects in the city. “It’s really hard to get to [Politics & Prose]. And I absolutely adore the Politics & Prose community, but it’s very neighborhood focused, it’s definitely an older demographic, it’s people with a lot more money,” Thorn said. The project was partially funded through a Kickstarter campaign, which aimed to raise $17,000 between Aug. 21 and Sept. 20. The campaign ended with a little over $20,000, giving the store some wiggle room to purchase sound equipment for hosting events like book tours and readings. Ruppert said while the primary function of the Kickstarter campaign was to raise money, it was also integral to his vision for developing the Petworth area. Upshur Street is situated in the residential Petworth neighborhood and, with Ruppert’s help, has turned into a hot-spot for retail in an area that has been marked by large construction projects.